Of course, there’s no reason for it sitting around so long. A toy oven belonging to a 22-year-old college graduate is about as obvious as clutter gets! I’m not even going to venture an explanation for how I let that happen. Anything I could say would be, well, half-baked. Last summer I bought a small garden fountain to put on my front porch, which faces north-northwest and is always in the shade. The porch had seemed so dark and still with nothing but the doormat to brighten it up! The fountain definitely adds cheerful energy; and for those interested in feng shui, that spot is the house’s north compass point where a fountain traditionally would be placed. All good! 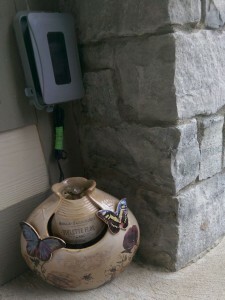 The garden where I planted the alyssum shown in last Thursday’s entry is on the other side of the stone pillar shown in this photo. I also have snapdragons planted there, along with astilbe in a shady corner, and two varieties of hostas. It always lifts my mood to look out the window and see the flowers all summer long! Of course, in the winter there’s nothing but bare ground, and the fountain has to be brought indoors and put away until spring; but for now, there’s plenty of time left to enjoy both the fountain and the garden! Over the long weekend I spent some time pondering how to answer a message in a text conversation with a friend. I mentioned to her that my daughter, who graduated from a nursing program last year, had found a good job on the orthopedic floor of a local hospital after passing the licensing exam. Somehow that sentiment, which of course is not at all unusual among parents in today’s world, sent my thoughts flying off in many directions at once. Yes, getting one’s kids through college and then into good jobs is indeed a reason to celebrate! But I wouldn’t say that it marks a sharp dividing line—or a finish line—where a parent’s job is done and there will never again be any worries. So many unpredictable things can happen, both in the workplace and in other areas of life. And in a culture that measures success in terms of diplomas hanging on the wall and prestigious jobs, most people fall short. At present, there are nowhere near enough of those jobs to go around. It’s not snobbery that creates such demanding expectations. Rather, we worry that our kids will struggle through a hard life if they don’t get off to the best possible start, and we feel responsible for making sure that doesn’t happen. Because most of today’s young workers will change jobs many times and perhaps change careers as well, a first good job does not have as much predictive value for lifelong success as it once had. So it’s not nearly as useful of a benchmark for judging what we have accomplished as parents, which is what prompted me to write this post in the first place! I believe we can’t go too far wrong if we measure parenting success in terms of raising children of good character, just as our ancestors did. When I finally gave that reply to my friend after working through my thoughts, she agreed that raising kind responsible loving kids with creative curiosity and some ambition is all that is needed to feel that they might do well out there. 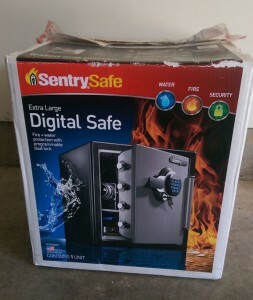 A fire safe is useful both for ensuring that important documents are not destroyed in the event of a calamity and for keeping them in one centralized location so they don’t get lost. Electronic models with keypads are easy to use, but they do wear out after a while. Most home improvement stores sell them, so it’s not hard to get another. The problem is disposing of the old one, as they’re too big and heavy to put out with the trash. We bought a new safe earlier this year. My husband boxed up the old one and put it in the garage, thinking that he’d check into whether there was any place to take it for recycling; and if not, he could take it to the county dump. He got busy at work, though, and it has just been sitting in the garage gathering cobwebs all spring. That old safe has definitely overstayed its welcome! Edit, May 27: My husband called around, but couldn’t find any recycling shops that would take it. The issue is that the time spent removing the material in the walls of the safe is not worth the cost of the scrap. So he took it to the dump this morning. 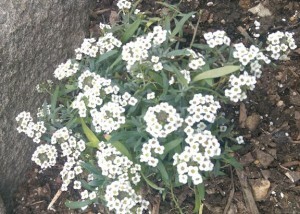 I plant sweet alyssum in my garden every May, and it always makes me feel peaceful and happy. The blossoms smell lovely—and they’re edible too, as alyssum is related to broccoli. It is native to Mediterranean countries, where it sometimes is used in salads. Alyssum means “without madness,” which comes from the ancient Greeks’ use of the plant as herbal medicine to calm angry feelings and promote emotional balance. They also believed it could prevent rabies. In warmer climates alyssum grows year-round, but where I live it gets too cold for that! Having to replant it every spring is okay, though, because working in the garden helps with feeling more centered and (literally) grounded. So, alyssum is good for self-nurturing whether it is eaten or whether it is planted just for its pretty blossoms and pleasant fragrance. Either way, it’s part of a peaceful and calming flower garden! One question that people are regularly asked in opinion polls is whether they believe that their children will have better or worse lives than theirs. Considering how fast technology has been advancing and how many new choices we have in today’s world, one might expect a lot of optimism. But in fact, it’s the other way around—many people have become convinced that their children’s lives will be harder. Why so much gloom? Don’t we like having plenty of choices? Well, maybe not so much. Although we might not want to go back to the days when there were only three commercial TV networks and playing games meant the cards and board games in the closet, we now have at our fingertips literally millions of ever-changing ways to spend our time. That’s just plain overwhelming. And, who knows what’s happening with the economy and our jobs? When we try to imagine what our children’s lives will be like, we end up with a jumbled mental picture that’s a blur of confusing details. Confusion=bad. I have to confess that I got distracted while writing this entry, which I meant to post yesterday. My mind filled up with random thoughts about what I might be doing several years from now, how this blog would fit into the life of a future me, and whether or not I would accomplish anything significant in those potential scenarios. And that illustrates a large part of the problem—we’ve gotten so used to thinking in terms of goals and accomplishments, rather than simply enjoying the moment. Once upon a time, when we were young, it was okay to just sit under a tree and write notes in a journal. If we looked up from the page and watched an ant climbing the rough bark or a hummingbird hovering beside a fragrant flower, we didn’t feel obligated to do something more productive instead. Life felt complete in itself; we didn’t look upon it as consisting of goals and tasks to be worked through according to business principles of efficiency and continuous improvement. Now we are far removed from those long-ago days when mindfulness came easily to us. It’s hard to imagine either that we’ll find our way back to that peaceful mindset or that our children, having grown up in such a busy world, will ever know what it was like. Of course, any of us could set aside time each day to clear away our worries and distractions—but we overcomplicate that also, and the idea of a simpler life becomes just another to-do that hasn’t gotten done. That’s probably why bucket lists have become so popular, too. Modern humans lead such regimented lives and are so afraid of not getting things done without a schedule, it seems perfectly normal to plan out every major activity for an entire lifetime. That’s not for me! Just to remind myself that I’ll always have plenty of fun choices, even though there’s no telling what might happen in the future, I keep random notes on things I might want to do someday. If I never get around to them, well, that’s perfectly fine because there are so many other possibilities! 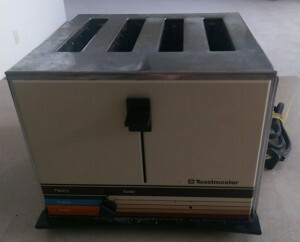 One of my gifts at Christmas was a toaster, as shown in my New Year’s post. I decided to keep it on the countertop because it was new and pretty, instead of putting it away in a cabinet after every use as I had done with the toaster it replaced. You can probably tell where this post is going. The old toaster stayed on its usual cabinet shelf, just because we’d gotten used to seeing it there and did not notice it was clutter. This is the second story in a series of three. Click here to read the first. It’s always so pretty in the park when the sun is shining straight down at midday. Julie has been working for the park district as an assistant groundskeeper since she finished high school, and she loves it. Even though the park is in the middle of the city and there are tall buildings all around, Julie can hear birds singing and see the green grass and trees, just like when she lived on the farm with Aunt Kathie and Uncle Hank. She has a mom and dad, too, but they live in another city far away. Aunt Kathie once told her it was because taking care of a sick baby had been too scary for them. Julie had to have heart surgery when she was very little because she has Down syndrome. That’s also why she needed extra help in school. The park’s concrete walkways sparkle as the sun blazes down from a cloudless sky. Julie’s edger hums along, trimming back the grass. She imagines that maybe the grass is afraid it will get hurt, like when she was a little girl and cried about getting her hair cut. Bits of grass are scattered all along the concrete behind her, breaking up its flat white sameness. Julie knows she’s talking to herself as much as to the grass. Moving to the city and learning how to live in an apartment had been scary. Uncle Hank had told her she would be safe and there was no need to worry. Uncle Hank is a reverend, and he preaches at the old wooden church down the road from the farm. This year he’s been talking a lot about Providence, gratitude, blessings, and things working out for the best. Julie likes that word, Providence—it has such a pretty sound to it. She also likes the word “reverend,” and once she looked it up in the dictionary, finding that it was part of a set of related words. Revere, reverential, reverence. Sometimes words can be fun. Math, well, not so much; but Aunt Kathie helps with the shopping and bills. “Rev-er-ence,” Julie chants even more softly, feeling that she is now in perfect tune with the hum of the edger. She’s getting close to the end of the walkway, where orange and yellow daylilies spread out along the side of the park. A woman has set up an easel beside them and is dabbing with a small brush at her canvas, filling it with bright dots of color. Just beyond the daylilies there’s a sidewalk and street with people busily going by. Most of them aren’t looking this way—they’re watching the traffic or talking on their mobile phones. Only the artist painting the lilies seems like she’s fully here. A pigeon grabs a crumb and hops out of the way of the edger. Two robins are chattering to one another in the grass. As Julie comes closer they take flight, landing on a low branch of an ornamental plum tree. The thick purplish leaves almost glow in the brilliant sunlight. Looking up farther, above the trees, the sky rises into a clear blue vault full of sparkling treasures—wide open for anyone to reach, and so beautiful. The artist turns her head, tossing a long dark braid back over her shoulder. For a moment the two women’s eyes meet, and Julie waves a hand before she even thinks about what she’s doing. Overflowing with joy, she imagines that it’s radiating from her in all directions, like the sunlight. “Reverence,” she says one last time, in a whisper so low that she can barely hear her own voice. She feels certain it’s a blessing from Providence that she has shared. Click here to continue to the third and final story in the series. Recently I’ve been considering how many things in life help to keep us safe as we go through our days. No matter how many we can list, though, it can be hard to let go of worries (most of which have nothing to do with actual present-day events) and to feel safe. So I decided to post a photo of the handrail on the stairway leading up to my second floor to illustrate that there is always something to hold on to, and that’s where the focus needs to be. Of course, sometimes we miss our grip. 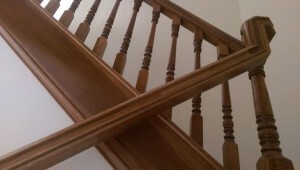 Last summer I slipped at the top of the stairs while carrying laundry and bruised my back. But bruises heal, lost or broken property can be replaced, and plans that don’t work out provide useful lessons going forward. What’s important to remember is that we never really have to go through life without help and totally vulnerable to random stuff, even though our worries may trick us into feeling like that sometimes. The light bulb in the plastic jack-o-lantern burned out, and then it just sat in the basement for years because nobody ever got around to replacing the bulb. That in turn left us feeling less interested in doing anything with other Halloween decorations. Now, after they’ve been cluttering my basement all this time, I just want them gone. 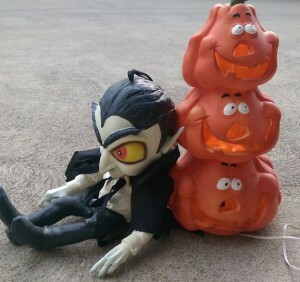 Next time I put a jack-o-lantern on my porch, I’ll get a real pumpkin and a candle, and do it the old-fashioned way. That’s more fun anyhow!